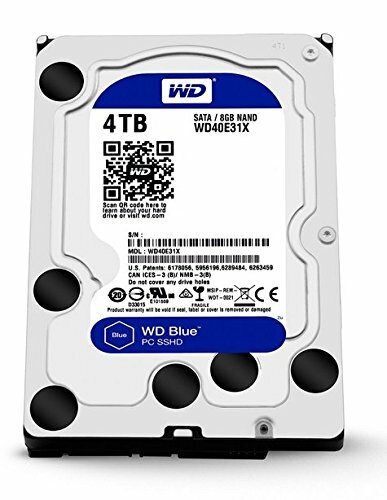 WD Blue SSHD 4TB Desktop Hard Disk Drive - SATA 6 Gb/s 64MB Cache 3.5 Inch - WD40E31X by Western Digital at Pacs BG. MPN: WD40E31X. Hurry! Limited time offer. Offer valid only while supplies last. WD Blue Solid State Hybrid Drives (SSHD) combine a generous amount of NAND flash SSD technology and massive HDD storage capacity into a single drive. WD Blue Solid State Hybrid Drives (SSHD) combine a generous amount of NAND flash SSD technology and massive HDD storage capacity into a single drive. WD engineers team up the best of SSD and HDD to produce a hybrid that can increase overall system performance - resulting in quicker system boots, faster application loads, and improved responsiveness when compared to traditional hard drives.